Static electric and magnetic fields, as well as variable electromagnetic fields are used extensively at the University of Toronto, primarily for research and in telecommunication. The University of Toronto is committed to ensure that the use of static electric and magnetic fields and variable electromagnetic fields at the University is carried out in a safe manner with due regard for employees, students, the public and the environment. The University of Toronto Radiation Protection Authority (UTRPA) is charged with ensuring the existence of effective radiation safety programs for each type of radiation. The Radiation Protection Service is charged with the administration of the radiation safety programs. In a work place environment with static magnetic fields above 2 T (tesla), rapid motions can create transient sensory effects. Metallic objects in higher fields can create a projectile hazard. Workers with implanted ferromagnetic or electronic medical devices can suffer from interferences with magnetic fields above 0.5 mT [1, 6, 7, and 8]. Strong static electric fields can create spark discharges in the vicinity of conductors or contact currents that can lead to electrocution. Ungrounded objects can acquire electrical charges if located in strong static electric fields and can also create contact currents. There are no proven chronic (long term) effects of static electric and magnetic fields with values under the limits in Table 1. CAUTION: Strong magnetic fields can erase magnetic media, disabled ABM and credit cards, and damage some watches. Acute effects of exposure to extremely low frequency (ELF) EMFs on the nervous system are: the direct stimulation of nerve and muscle tissue and the induction of retinal phosphenes. There is also strong indirect scientific evidence that Central Nervous System (CNS) functions, such as cognitive processing, can be affected by induced electric fields below the threshold for direct stimulation. In addition, painful currents can occur when a person makes contact with a conducting object at a different electrical potential. All these effects have thresholds, below which they do not occur. The adverse effects can be avoided by meeting appropriate basic restrictions on electric fields induced in the body and on contact current. Strong electric fields in this frequency range can produce a wide range of safety hazards like spark discharges and contact currents from ungrounded conductors. Prudence shall be taken when handling flammable materials (possible combustion and ignition), or electro-explosive devices (explosion) in strong electric fields. EMF magnetic fields were classified in 2002 by the World Health Organization in category 2 B as “possibly carcinogenic to humans” This category is used for agents, mixtures and exposure circumstances for which there is limited evidence of carcinogenicity in humans and less than sufficient evidence of carcinogenicity in experimental animals. The basis for this classification was the epidemiologic results in some studies on childhood leukemia. In the same category 2B (possible carcinogenic to humans) is coffee. Coffee may increase the risk of kidney cancer while at the same time being protective against bowel cancer. The most consistent effects of acute RF and microwave exposure on humans are the thermoregulatory responses of the cardiovascular system to RF-induced heating, increasing heat loss from the skin through increased skin blood flow and evaporative heat loss from sweat. Most recent studies  of human subjects, including adults, children and adolescents, have focused on the possible effects of essentially non-thermal exposures to mobile phone type RF, often simulating mobile phone use and so only involving localized exposure of part of the head. A number of non-thermal interaction mechanisms have been proposed but to date none have been experimentally confirmed. A wide range of subjective symptoms including headaches and migraine, fatigue, and skin itches have been attributed to various RF sources both in the home and the workplace. However, the evidence from double-blind provocation studies suggests that the reported symptoms are not causally related to EMF exposure. Thermally significant RF exposure can impair male fertility and cause increased embryo and fetal losses and increase the incidence of fetal malformations and anomalies. Such effects have not been consistently shown at exposure levels that do not induce temperature elevation of 1°C or more. The studies that have addressed postnatal developmental indices or behavior after prenatal exposure to low level RF radiation have generally reported lack of effects. Effects resulting from long-term exposure during the development of juvenile animals have been addressed in only a few studies, and the data are insufficient for conclusions. Cataracts in the eyes of anesthetized rabbits remain a well-established thermal effect of RF exposure. However, primates appear to be less susceptible to cataract induction than rabbits, and opacities have not been observed in primates following either acute or prolonged exposures. Concerning cancer-related effects, the recent in vitro and animal genotoxicity and carcinogenicity studies are rather consistent overall and indicate that such effects are unlikely at specific absorption rate (SAR) levels up to 4 W kg-1 [3,4]. With regard to in vitro studies of RF effects on non-genotoxic end-points such as cell signaling and gene/protein expression, the results are more equivocal, but the magnitudes of the reported RF radiation induced changes are very small. In Canada there are no limits established for static electric and magnetic fields. The Ontario Ministry of Labour uses American Conference of Governmental Industrial Hygienists (ACGIH) limits . These limits are presented in table 1. It should be mentioned that these limits are similar to the limits recommended by the International Commission of Non-Ionizing Radiation Protection (ICNIRP) . Intervention levels at the University of Toronto are established at 1/2 of the values from table 1, except for medical device wearers. The limits for static magnetic field for medical device wearers remain at 0.5 mT, unless specified by the medical doctor who approved the implementation of the medical device. For EMF with frequency from 1 Hz to 3 kHz, the University of Toronto will apply the limits recommended by ICNIRP. There are very small differences between ICNIRP and ACGIH limits. The ICNIRP limits are presented in tables 2; 3 and 4. Intervention levels at the University of Toronto are established at 1/2 of the values from tables 2, 3 and 4. The limits recommended by Canada Safety Code 6 will be applied at the University of Toronto in this frequency range. They are presented in tables 5, 6, 7 and 8. * At no point in time shall the root mean square (RMS) values for induced and contact currents exceed the reference levels with an instantaneous reference period in Tables 5 and 6. In the case of currents with amplitude modulation, the RMS value during the maximum of the modulation envelope shall be compared to the reference level. ** For exposures shorter than the reference period, currents may exceed the reference levels, provided that the time average of the squared value of the current over any time period equal to the reference period shall not exceed IRL. For exposures longer than the reference period, including indefinite exposures, the time average of the squared value of the current over any time period equal to the reference period shall not exceed IRL. Intervention levels at the University of Toronto are established at 1/2 of the values in tables 5, 6, 7 and 8. Generally a safety factor of 10 was introduced in calculating the limits presented in tables 1 to 8, however, these are considered ceiling values and should never be reached. The supervisors will receive training in identifying the EMF hazards. Examples of devices that can produce electric and magnetic fields above the limits are presented in Appendix A. When new equipment producing large EMFs is bought or manufactured, and installed in a University of Toronto controlled area the Radiation Protection Service must be informed. The supervisors of work places in all areas controlled by the University of Toronto with fields possible at levels above University of Toronto intervention limits shall contact the Radiation Protection Service (RPS). The RPS will perform measurements to identify the high field areas and compare the results with values from tables 1 to 7. All areas found with values above the intervention levels will be considered controlled areas. Controlled areas will be marked with appropriate warning signs for electric or magnetic field, and access will be restricted to trained personnel. All rooms, areas, enclosures with magnetic fields density above 0.5 mT will have a sign indicating restricted access for persons with medical implanted devices that may interfere with magnetic field. Examples of these signs are presented in Appendix B – Electric and magnetic fields warning signs. All rooms, areas and enclosures with values of electric and/or magnetic fields above the University of Toronto intervention levels will be marked with similar signs with the ones presented in Appendix B. All rooms, areas and enclosures with values of electric and magnetic fields above the University of Toronto intervention levels will be secured to prevent unauthorized access. This can be achieved with walls, doors, barriers, fences, etc. All persons with access to the EMF controlled areas will receive training covering: EMF hazards identification, health effects, signs, engineering control measures, operating procedures. Periodic refresher training will be delivered. The refresher training will cover: changes in the regulations and in the University of Toronto EMF safety program, changes in work procedures, etc. Tools used in magnetic fields above the intervention levels will be made of non-magnetic materials. If a person needs to perform work in an area that may have values close to the values from tables 1 to 8, the person shall wear personal protective equipment and a field warning instrument with visible and audio signal. An annual inspection of all existing areas with EMFs above the intervention levels. will be performed by a Radiation Safety Officer (RSO). In addition, all new equipment or devices that can produce high levels of EMFs will be inspected by the RSO before the equipment or device is used. In performing a workplace inspection involving EMF hazards, the check sheet in Appendix C will be used. *Federal legislation requires that microwave ovens be constructed to meet stringent microwave leakage limits and to have safety interlocks. When these interlocks are defeated, for example, during repair work, there is a risk of overexposure to microwave radiation. Checklist for workplaces with high electric and magnetic fields. Required for laboratories with equipment that can produce electric or magnetic fields above the limits specified below at any accessible point. 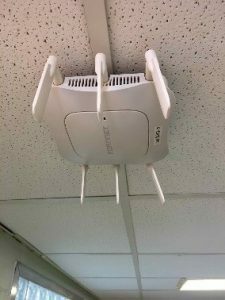 The purpose of installing new antennas inside the U of T buildings is to ensure a better cellular coverage in different areas of the buildings. Usually the antennas installed inside the buildings are omnidirectional. Typical omnidirectional antennas are shown above. The power of these antennas is in the range of tens to hundreds of mW. The field intensity reaches the U of T intervention level (10% of the public limit exposure) at less than 25 cm from the antenna. At a distance above 25 cm from the antenna, the EMF poses no risk for health and safety of students, staff, faculty or public. After the installation of new antennas, the U of T Radiation Protection Service will perform measurements to confirm the field intensities predicted by the Canada Safety Code 6 analysis. The purpose of installing new antennas on top of the U of T buildings or on towers is to ensure a better cellular coverage in different areas of the campus. Usually these antennas are directional. A typical directional antenna is shown above. The power of these antennas is in the range of tens of W. They are installed on the buildings roofs or on towers. Typical will be 3 antennas at 1200 from each other to cover a maximum area. When they are installed on the roofs, the orientation of the main lob of the antenna is towards the outside of the building. They are installed as close as possible to the roof’s edges to ensure the best coverage. The maximum danger is in front of the antenna. As can be seen from the horizontal and vertical field distributions, the field behind and below the antenna is extremely low. The field on a line perpendicular to the main lob, can also reach levels above the U of T intervention value. This field decreases under the U of T intervention level at a distance less than 2 m.
At a distance above 2 m from the antenna (behind, below or on a line perpendicular to the main lob), the EMF poses no risk for health and safety of students, staff, faculty or public. Since the antennas are installed close to the edge of the building, keeping a 2 m distance from the edge of the building (as is required by the working at heights procedure), will ensure that persons are not exposed to EMF radiation above the U of T intervention level. Because of the possibility of the field being above the U of T intervention level, access to the roofs or to the towers must be controlled. On all doors accessing the roofs where antennas are installed, a sign must be posted indicating that at a distance under 2 m from the antennas the electro-magnetic field is above the U of T intervention level. Persons accessing the roofs must keep 2 m distance from the antennas. All workers who need to go closer to the edge of building must receive the “working at heights safety training” and avoid being in front of the antenna at all times.